Gold, White, and Black Gavin. Shines and sparkles and stands out on stage! 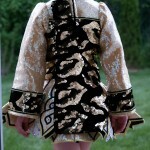 Comes with bloomers and 2 headbands (one is black with crystals – the other is yellow with sequins and crystals). More measurements and/or pictures on request.